David Fletcher Jones, was born on 14 August 1895 in Golden Square, Bendigo. He was the second son of Samuel Henry Jones, a miners blacksmith (toolmaker) from Cornwall and Mahala Johns from Bendigo. His mother died when he was two. The family was Methodist in religion and Labor in politics. In 1908, DFJ left Golden Square State School and worked for 2 years in a Bendigo suction house and for 3 years as a tomato grower at Kangaroo Flat. On 15 July 1915, he enlisted in the AIF, served in France, was repatriated in 1917 and was granted a TPI pension in 1918 as a result of suffering from shell shock. He worked as a door-to-door salesman in Melbourne and later as a hawker in the Western District and South East South Australia. On 22 September 1922, DFJ married Rena Ellen Jones whose family were fellow members of the Golden Square Methodist Church. Rena, a primary school teacher, provided him with moral support and encouragement through 48 years of marriage and business ventures. They had three children; Ralph, Lois (Mrs Meurs) and David. Rena Jones died in 1970. 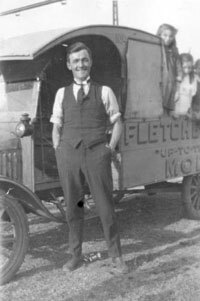 In 1924, after 2 years on the road with trucks and marques Rena and Fletcher decided to settle in Warrnambool. FJ leased three adjoining shops in Liebig Street. 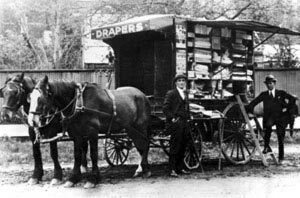 Selling Men’s and Boy’s wear, Hosiery, and Linen and Manchester. After initial severe financial difficulties the business prospered and was transferred to different locations in Liebig Street throughout the 30’s. In 1924 he opened a small tailoring workroom. By 1939 the bespoke tailoring workroom was one of the largest in provincial Victoria but the main business was men’s apparel retailing. During the 30’s he started making ready to wear trousers as ‘fill in’ production. During WW2, in 1941, the firm provided ready to wear trousers for the man on the land at the request of the Department of Supply. These were wholesaled through 123 retailers in four States. As a result of these retailers being reluctant to stock the multiple fittings required for a successful RTW operation, FJ opened his own shop in Collins Street Melbourne in 1946. This venture was an outstanding success. Fletcher Jones became a major Warrnambool and District employer and played a pioneering role by transforming his business into a co-operative. He was influenced by a Japanese Christian Socialist, Dr. Toyohiko Kagawa who was a pioneer of consumers’ and farmers’ co-operatives, Fletcher Jones supported Kagawa’s visit to Australia in 1935 and visited Japan in 1936. In January 1947, FJ travelled overseas to study clothing manufacturing machinery and processes with particular attention to the manufacture of ready to wear apparel (a new trend) as opposed to bespoke tailored apparel. This trip had considerable impact on the layout and equipment installed at Pleasant Hill. Fletcher Jones introduced the latest European and American production methods in his new factory built in the late 1940’s on a former quarry site in east Warrnambool. The factory in a landscaped garden setting at Pleasant Hill became a tourist attraction. Fletcher Jones and Staff Pty Ltd was registered in December 1947 after the staff co-operative was formed in 1944. The staff held 53% of the shares in the early 1950’s and over 70% by the 1970’s. The firm expanded its product range beyond trousers to women’s skirts and slacks in 1956 after winning the contract to outfit the Australian Olympic Team. The firm was in the forefront of new ideas and technology, including methods engineering, a textile testing laboratory, computerised design and cutting systems. In its heyday, the company employed 3000 people, had four factories and over 50 retail stores throughout every Australian State. Fletcher Jones enjoyed a simple lifestyle. He gave away most of his money, anonymously. He was appointed O.B.E. in 1959 and was knighted in 1974 for ‘his services to decentralisation and the community’. He remained chairman of the company until 1975 and died on 22 February 1977. He was buried in the Warrnambool Cemetery on 24 February after a United Methodist service.